What’s the Stories? Is Instagram Having a Moment? You’d be forgiven for thinking Pinterest is another social network like Facebook or Twitter. Dig a little deeper and you’ll find that people on Pinterest are bookmarking content that they intend to use at a later date, not sharing it with others. We look at one of the lesser known advertising platforms and why you’re missing out by not adopting it. Pinterest vs Facebook and Twitter? Social networks, like Facebook and Twitter, act as news hubs for people online. Advertising here means you’ll be competing with the noise of personal news and updates where ads can get lost in a sea of selfies. If these social networks were your local pub, then Pinterest would be your local library. Pinterest users are in a completely different frame of mind, with many seeking inspiration. The human brain is wired to respond to visual stimulation and Pinterest provides that in buckets as users enjoy a visual journey of discovery. When users find something they like, they save or ‘pin’ it for later use. Unlike social networks which strive on you remaining in the virtual world, Pinterest is all about you finding something you like which leads you to act in the real world. When you ‘like’ or ‘share’ something on Facebook, you’re doing so for others to see. 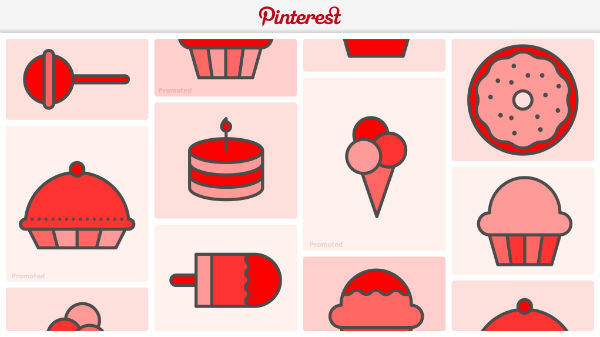 On Pinterest, you’re ‘pinning’ content for yourself because it appealed to you. So, why advertise on Pinterest? People are designing their lives on Pinterest and as a result, the platform has a unique understanding of user intent. This presents a golden opportunity for your brand to connect with people at the right time during their journey of discovery. Our 2017 E-commerce KPI Benchmarks Study found that sessions originating from Pinterest also generate higher Average Order Values. Advertising on Pinterest also comes with the benefit of being a less noisy environment where you’re not interrupting the user from personal feeds. Personalised search has been one of the platform’s primary focuses during its growth and thrives by showing content within the ‘adjacent interests’ of its users. If people are searching for wedding inspiration, their adjacent interests would include travel, music, fitness, photography and food. Who should advertise with Pinterest Ads? Most businesses could benefit from an active presence on Pinterest, once it’s done right. St. Patrick’s Day was one of the early Tesco Pinterest Ad campaigns; a simple collection craft ideas and recipes. This board performed well but we wanted to harness even more of Pinterest’s awesome advertising power. Pinterest has great visibility of people’s intentions that advertisers can tap into. This is on top of the usual keyword, location, device, language and demographic targeting. To really squeeze the most out of Pinterest Ads, we segmented our Easter campaigns into ‘crafts’ and ‘recipes’, allowing us to deliver even more relevant content to the right people. This approach brought three times more engagement than the industry average versus a twofold increase seen in the previous month. 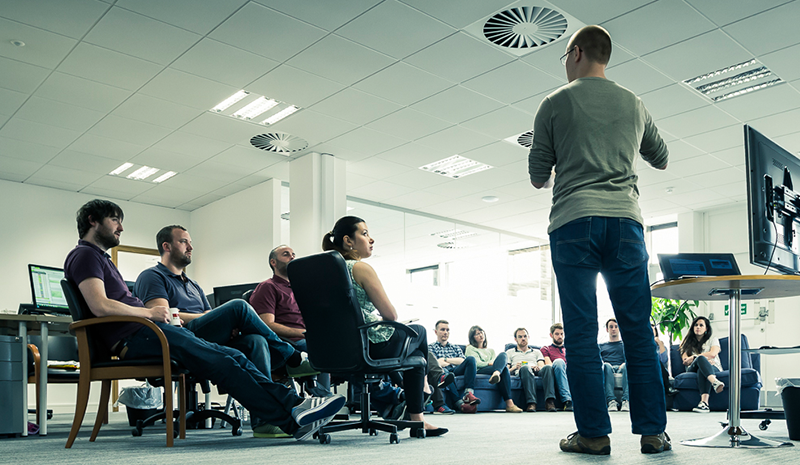 When it comes to innovation, early adopters reap the rewards. Pinterest Ads is a young platform, which means it’s cost effective. Engagements are great value with the cost per engagement for Tesco’s Easter campaign coming in 57% below Pinterest’s average CPE and 26% below the average Facebook cost per click in April. The key takeaway here is even though it costs less than Facebook Ads, Pinterest lets you land ads in front of a highly engaged audience by targeting them based on their future intentions. While engagement on Pinterest was great value for Tesco, it was also great quality. 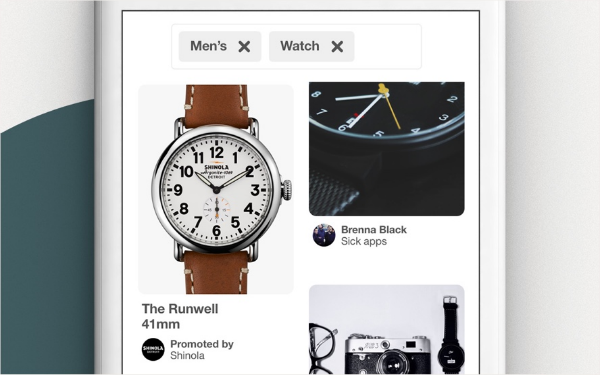 Pinterest isn’t shying away from ensuring you get the most from your money and has already introduced third-party verification to ensure a human has actually seen your ads. Furthermore, because of Pinterest’s search engine development and deep knowledge of user intent, the content people are seamlessly served is more relevant. This combination of relevant content at a time where users are likely to act provides your brand with a great opportunity to grab the user’s attention. 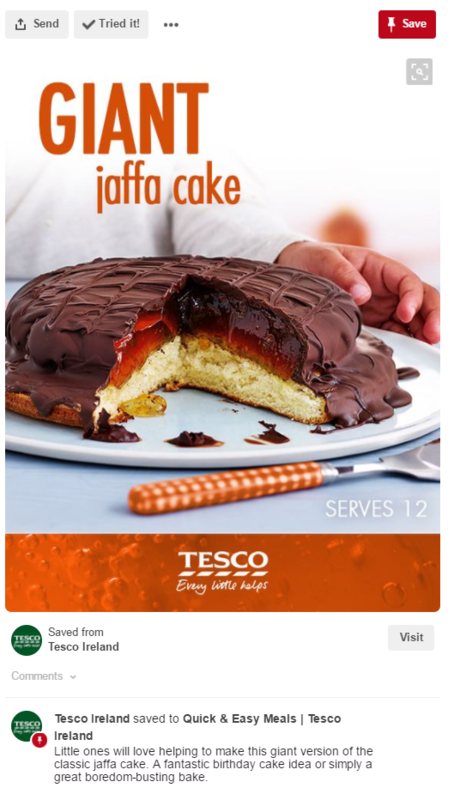 Our research has shown that Pinterest users react best to content like this recipe for a giant Jaffa Cake, which inspires users with a practical use for a range of Tesco products. There are plenty of food retailers that will sell you a pack of orange jelly, but only Tesco will show how you to create a giant Jaffa Cake. This content proved most popular because there is a direct route to a real world action with recipes people can rustle up in a jiffy making the top of the list. As a result of this touchpoint, these inspired users arrive on-site in a different frame of mind and behave differently to traffic from social networks. In April, traffic originating from Pinterest spent over five times longer on site and was less likely to bounce than users visiting from Facebook. We found traffic from Pinterest was also 55% more likely to browse other pages of the site than traffic from Facebook. Social networks are great for advertising, but you will always be competing for people’s attention in a noisy environment. Pinterest allows your brand to step away from that noise with the customer. Only 44% of Irish businesses have adopted and maintained a presence on Pinterest, despite having the added advantage of being one of only six countries capable of promoting content through Pinterest Ads. Pinterest Ads let you target people using the usual demographic and geographic details, but its real power lies in the ability to target people based on future intentions. Pinterest is your digital marketing crystal ball, giving you the ability to reach the right customers with relevant content at the right time.